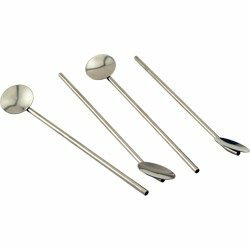 The steel spoon straws from Danesco have a plethora of uses. I’ve seen them used by bartenders for mixing and serving drinks. I’ve seen them used with that cool South American Mate drink. I’ve seen them used in Ice Cream parlors to get the last little bit of delicious out of the bottom of the metal milk shake cup. And best of all, it’s a straw that you didn’t know you had when you don’t have any. Cause really, who keeps straws in the house? 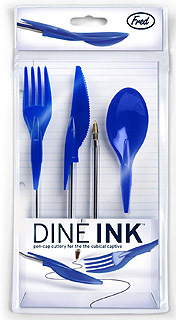 Clever pun (Dine Ink) or clever idea or both? Sitting at your desk with a pudding cup and no spoon or a Cinnabon without a fork and knife is a terrible thought. 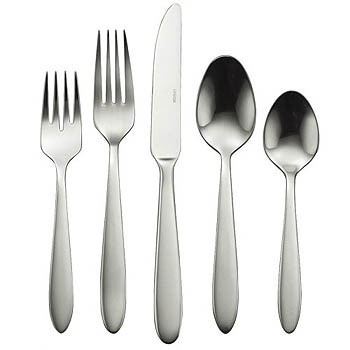 We looked at portable cutlery sets before but this one is the smallest and least expensive. And it is ever so clever using the pens you have at hand. This is a student stocking stuffer if I’ve ever seen one. Especially if they are in culinary school. You’ll be happy to know I’ve created TWO separate words for spoons! Janko and planko. Planko is for a spoon with food on it. Janko is for a spoon with no food on it. Let’s just address the tweepodok in the room.